Lorne Campbell born 18-- in Ottawa, Ontario. 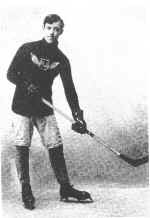 He played on the IHL Portage Lake Team 1904-05. Delore "Chub" Chaput, (1887-1941) born in Houghton, was a standout hockey and baseball player in his day, an all around athlete. He grew up in nearby Hubbell on Torch Lake. He played pro/semi pro in both hockey and baseball. In an exhibition game against the Detroit Tigers, he pitched 5 innings, striking out 5, including the great Ty Cobb. In August 1920, Chub pitched 17 innings in one game! He was on the mound for Hubbell against "a power house Calumet team" striking out 20 batters, including George Gipp of nearby Laurium. The game was called because of darkness; ending in a 6-6 tie. Chub played on hockey Championship teams in Mohawk, Calumet and Portage Lake. In one game, Portage Lake defeated Calumet 4 to 1: he scored 3 of the goals and assisted in the other. "The spectacular rover" as he was usually called by the media, was a fast skater and had his share of penalties. Chaput was a crowd favorite in rinks in Ontario, Michigan, and Minnesota. These were the days when Copper Country hockey was inferior to none. 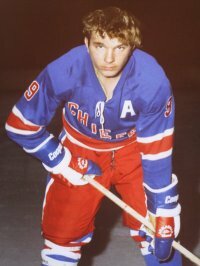 Chaput played rover and was usually his team's high scorer. In 1910, he scored 15 goals in 10 games while playing for Mohawk in the Glaciadom. At a game in Duluth in 1916, the local reporter seemed to run out of adjectives; "Rover Chaput roved with great effect and beautiful execution, netting 3 of the visitor's goals and all times playing a great game." ....He served his country in WWI with a hospital unit in France, and he led his Baseball team to the Armed Forces Championship in 1918, when he chalked up a 17-1 record. His pitching finesse, plus his ability to speak French, lead to his appointment as one of two men in France selected to teach the Frenchmen how to play baseball; the other was Johnny Evers, the famous major leaguer." He also served as an interpreter between the Americans and the French Officers. Chaput played baseball in the summer and hockey in the winter. After getting married, he settled in Chisholm, MN on the Mesabi Iron Range, where he was the city athletic director and the Chisholm High School Hockey Coach. Long after he left here, the locals would "boast about the local boy who made the big time" in referring to Chub. Info from the Houghton County Museum. Chub on the Red Jacket Team from Calumet area. "Chaput pronounces his name "Shippee" with an accent on the "pee" according to the newspaper at the time. Please contact webmaster if you have any hockey Team pictures with Chub on them. "Babe" Colombe born 19-- in -- coached local high school teams in the 1920's; and had been the manager for the Portage Lake teams in the 19--s.
William Oliver "Bill" Coombe (1927-2004) was born in Painesdale. He was a founding member of the Springfield Youth Hockey Association, 1961, in Illinois and a supporter of the Springfield Kings Semi-Pro Team. He was inducted into the Springfield Youth Hockey Hall of Fame and the Springfield Sports Hall of Fame as a Friend of Sport. He was a USA Hockey official, a USA hockey coach, and the coordinator of off-ice officials for the Springfield Junior Blues NAHL Team. 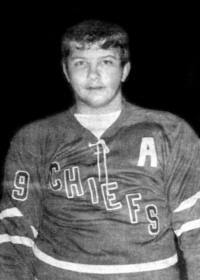 Bruce Coppo, (Sr) “CUKIE” was born 1944 in Laurium, played semi pro hockey with the Calumet Copper Country Chiefs 1972-76 and with the Calumet Wolverines. He was on the Gibson Cup winning team when he was just 17 years old. Bruce has coached the Calumet Wolverines since 1995 and was still a player for 8 of those years including the 2002 National Champion Wolverines. March 19, 2010 was Bruce Coppo Night at the Colosseum as Bruce stepped on the ice for the Wolverines as the Wolverines play their rival, Portage Lake Pioneers. This will mark Coppo's sixth decade of playing with the Wolverines, and his seventh decade of playing in the Colosseum! need more pics of Bruce here! Bruce Coppo was born on December 13, 1944 in Calumet and grew up in the small nearby community of Centennial Heights. It was on the Heights neighborhood rink that Bruce learned to skate and play hockey. Although there was no real organized youth hockey in his early years, Bruce learned how to play the game and hone his skills by playing pick-up games against friends and youngsters from other nearby communities. In 1954, the first formal youth hockey program was established in the Calumet area and Bruce’s organized hockey career was on its way. It became apparent at an early age that Bruce was going to be something special on a hockey rink. His coaches noticed the fiery competitive spirit, the love of playing the game and the knack he was developing for scoring goals. He was always one of the best players on his team and was annually selected to the Calumet All-Star squad which represented this area in state tournament play. After high school, Bruce joined the Wolverine organization which at that time was one of four teams in a local senior league. It would turn out to be the beginning of the longest and most successful career in Calumet senior hockey history. He would go on to become this areas most prolific offensive player in a playing career that spanned 37 years and 5 decades (1963-2000 ) including the last 5 seasons as the Wolverine’s player-coach. 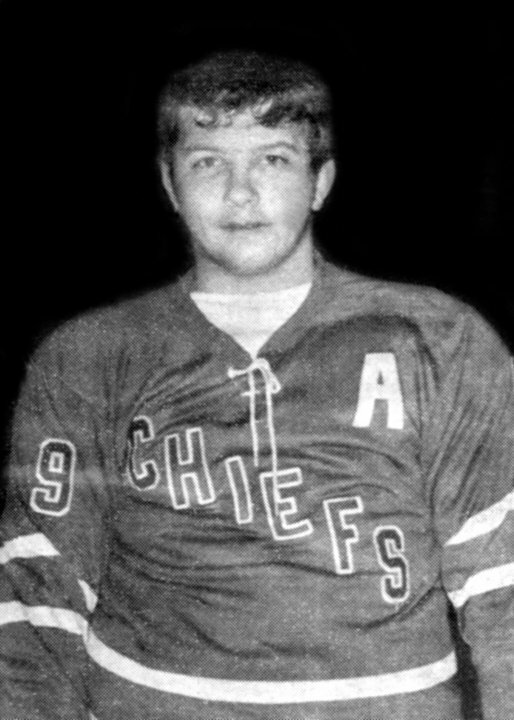 After the Wolverines joined the Northern Michigan-Wisconsin Hockey League in the late 1960's, Bruce’s name could be found near the top of the scoring leaders year after year. Although he could score from almost anywhere on the ice, he is best remembered for having a wicked back-hander that stymied goaltenders throughout the league. There is no accurate record of how many goals and points Bruce scored in his career, but we can say without doubt that it was far more than any other player in the history of local senior hockey. In 1972, senior hockey took a short hiatus when the Calumet area was awarded a franchise (Copper Country Chiefs) in the United States Hockey League (USHL). This league was a semi-professional circuit that used players who had performed at the pro, semi-pro, college, senior and Canadian Jr. A levels. The caliber of play was considerably higher than that of the senior league the Wolverines had been playing in. Bruce and a number of other local players were able to make the Chiefs roster and proved that they could elevate their skills to compete at a higher level. Although hampered by injuries from time to time in this league, Bruce still displayed his inordinate ability to score goals. After the demise of the Chiefs during the 1975 season, it wasn’t long before senior hockey was revived once again in Calumet. Bruce continued as a player with the new version of the Wolverines and in 1995 took on the added duties of head coach. He has continued to coach the team since his retirement as a player after the 1999-2000 season. 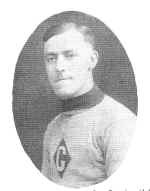 During his career as a player and coach he has won 12 Gibson Cups with the Wolverine’s while participating in the series against their southend rivals, the Portage Lake Flyers/Pioneers. One of the high points of his career came in 2002 when he coached the Wolverines to a national senior championship in Fond du Lac. 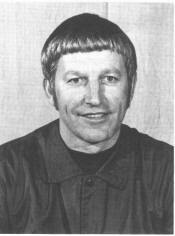 Prior to coaching the Wolverines, Bruce also coached a number of Calumet Midget travel teams over a 20 year period. In 1982, his CLK Electronics team won the state Midget A championship in Royal Oak and a year later in 1983 they won the state Midget AA championship in Marquette. The win in Marquette earned them the right to participate in the national Midget AA championship in Tinton Falls, New Jersey. Although performing very well, the Electronics finished as runners-up by losing to Chicago Budweiser in the championship game, 2-1. Besides playing and coaching hockey, Bruce has also served the game as an on ice official in high school hockey for 35 years and prior to that for many years in the Calumet junior hockey program. He has officiated state championship tournament games at both levels during his career. In recent years, Bruce has also played and officiated games in the Calumet Slo-Puck League. During this time he has served on the Calumet Junior Hockey Association board of directors, including a number of years as it’s president. Along with hockey, Bruce was a very competitive distance runner for the track team at Calumet High School and for a number of years played baseball on the Wolverine entry in the Copper Country Twilight Baseball League. In more recent years he played for various slow pitch softball teams. As part of the Copper Country Hockey Centennial project, Paul was interviewed by the Keweenaw National Historical Park; this tape is in their archives. 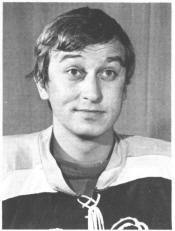 Coppo played for the USHL Green Bay Bobcats in the United States Hockey League from 1960-71 where he was the team's all-time leading scorer and a six-time league All-Star player. He was a player/coach for the Bobcats 1971-75 and was named USHL Coach of the Year in 1975. Coppo recorded 559 points (231-328) and was the Bobcat team's all-time leading scorer. He recorded only 164 penalty minutes in his 15 years as a Bobcat. John Mortimore Croze, (1913-56) Mort was born in nearby Laurium, played hockey for 4 seasons with Michigan Tech 1931-35. He was named Captain of the team and was an All-Star First Team selection in the 1933-34 Mid-Western Collegiate All-Stars. He later played with and managed the Portage Lake Senior team and refereed "scores of semi-pro hockey matches in the Northern Wisconsin and Upper Michigan District." Mort was instrumental in getting the Copper Country Junior Hockey League organized; he served as president of the League for many years in the late 1940's -1950's. A memorial "Mort Croze Cup" was bought by the League and presented annually to the League's PeeWee Champions. 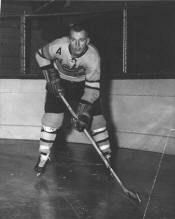 Mort is pictured here as Capt of the MTU hockey team.